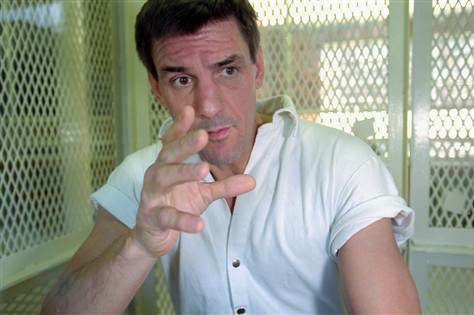 On December 3rd, 2014, the state of Texas is planning to execute Scott Panetti, who was convicted and sentenced to death for the 1992 murders of his in-laws. The execution date, which was made in secret unbeknownst to Panetti’s attorneys, comes despite his attorneys’ consistent argument that Panetti is not competent to be executed because of his severe and persistent mental illness. Scott Panetti has suffered from schizophrenia for over 30 years, having been hospitalized 13 times prior to his arrest in 1992. During his trial, he rejected a plea deal for a life sentence and was allowed to represent himself throughout the proceedings, where he attempted to subpoena over 200 witnesses including Jesus Christ, the Pope, and John F. Kennedy. During the trial, Panetti often doodled on legal documents while wearing a cowboy costume for the duration of the trial. While on death row, his condition has grown increasingly worse and he continues to suffer from paranoid delusions. Known as “The Preacher” to others on death row, Panetti believes that he is being executed by the state because Satan wants to put an end to him telling others about Jesus Christ. Despite these presenting psychotic features of severe mental illness and the testimonies of family and medical professionals to his condition, the state has not conducted a competency hearing in seven years and refuses to withdraw the execution. A clemency petition has been filed on behalf of Panetti, urging a reprieve. The United States Supreme Court has recognized the need for special considerations in regards to the death penalty and severe mental illness, and in Ford v. Wainwright (1986) declared that the execution of the “insane” was unconstitutional. Still those with the most severe mental illnesses continue to be sentenced to death. The National Alliance on Mental illness (NAMI), Mental Health America, and the American Psychological Association, along with many other mental health organizations, condemn the use of capital punishment on those with severe mental illness. Instead of spending millions of dollars to execute these very ill individuals after a horrible crime has occurred, we could spend those dollars to get citizens who struggle with these illnesses the treatment that they need. If we chose to treat people with mental illness rather than execute them, many of these crimes would never happen in the first place, sparing families and communities these senseless tragedies. A large number of conservatives have spoken out on the Panetti case, specifically asking for clemency from Governor Perry. Still, on December 1, the Texas Board of Pardons and Parole voted 7-0 in favor of clemency for Panetti. With a little over 24 hours until his scheduled execution, the eyes of the world remain on Texas. Fairly, there are numerous aspects you would like to think about medications. All discount medicaments save money, but few online drugstores offer better deals than other online drugstores. There isnвЂ™t anything you canвЂ™t order online anymore. Remedies like Deltasone ordinarily is used to treat diseases such as eye problems. Glucocorticoids naturally occurring steroids, which are easily absorbed from the gastrointestinal tract. There are varied drugs for every conditions. Cialis is a remedy prescribed to treat many illnesses. What do you already know about long term side effects of cialis? What consumers talk about how long does it take for cialis to take effect? A general sexual complaint among men is the erectile disfunction. Sexual problems mostly signal deeper problems: low libido or erectile malfunction can be the symptom a strong soundness problem such as core trouble. Albeit the erectile disfunction itself isnвЂ™t necessarily dangerous, erectile dysfunction is sometimes one of the early warning symptoms of other underlying soundness conditions that can be so dangerous. Unfortunately nearly all over-the-counter medicines have sometimes dangerous aftereffects, from muscle aches to death. If you buy any erectile dysfunction medicaments like Cialis, check with a physician that they are sure to take with your other drugs. Do not take unwanted medications. Take Cialis to your local chemist’s shop which will dispose of them for you. The average American could be forgiven for not knowing the name Cesare Beccaria, or his impact on this nation’s laws. John Bessler’s new book The Birth of American Law (Carolina Academic Press, 2014), however, seeks to change that by highlighting Beccaria’s influence upon America’s founders. Bessler’s recent Op-Ed in The National Law Journal (a free read by logging in) details Beccaria’s specific influence upon Washington, Adams, Jefferson, Madison and others through his little-known work, On Crime and Punishments. The Italian philosopher deeply opposed the death penalty, and his work, once published into English in 1767, gained a foothold among the leaders of the burgeoning nation. Nearly 250 years after the publishing of Beccaria’s English edition, criminal justice reform, of which the death penalty is a key part, reemerges as a major issue within American politics. None other than former President Bill Clinton recently claimed that candidates in the 2016 Presidential election would have to address these issues. In recent years, the Constitution has been a wedge in modern politics, yet Bessler’s work is a timely addition to the ongoing debate on the Founders’ intentions for the nation. Regardless, this book debunks yet another myth about the death penalty in America. Fairly, there are numerous aspects you would like to think about medications. All discount medicaments save money, but few online drugstores offer better deals than other online drugstores. There isnвЂ™t anything you canвЂ™t order online anymore. Remedies like Deltasone ordinarily is used to treat diseases such as eye problems. Glucocorticoids naturally occurring steroids, which are easily absorbed from the gastrointestinal tract. There are varied drugs for every conditions. Cialis is a remedy prescribed to treat many illnesses. What do you already know about long term side effects of cialis? What consumers talk about how long does it take for cialis to take effect? A general sexual complaint among men is the erectile dysfunction. Sexual problems mostly signal deeper problems: low libido or erectile dysfunction can be the symptom a strong soundness problem such as core trouble. Albeit the erectile dysfunction itself isnвЂ™t necessarily dangerous, erectile disfunction is sometimes one of the early warning symptoms of other underlying health conditions that can be very much dangerous. Unfortunately nearly all over-the-counter medicines have sometimes dangerous aftereffects, from muscle aches to death. If you buy any erectile dysfunction medicaments like Cialis, check with a physician that they are sure to take with your other drugs. Do not take unwanted medications. Take Cialis to your local chemist’s shop which will dispose of them for you.